Five people have been killed and nine injured in a plane crash in Ecuador. 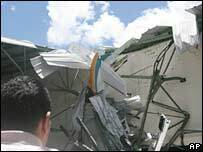 The small plane hit a tyre plant seconds after takeoff in the southern city of Cuenca, about 310 km (190 miles) south of the capital Quito. The aircraft was carrying 12 passengers and two crew from Cuenca to Ecuador's south-eastern city of Macas. The plane "was hanging out of the roof", which made the rescue difficult, Vicente Vallejo, a civil aviation official, told the AFP news agency. No-one on the ground was injured, officials said.